M&S Simply Food (originally introduced as Marks and Spencer Simply Food) is an express-format offshoot of Marks and Spencer's foodhall. On the motorways, it can now be found at most Moto services, including units at Extra services which Moto run. It also has sites within many BP petrol stations. The motorway shops were the first of their kind and quickly proved popular and many were extended to form mini-supermarkets, taking up a lot of shopping space and pushing out some smaller stores situated alongside. M&S impressed Holiday Which? Magazine, who said that the stores could be "well worth driving on the motorway for alone". Moto were also the first to find a loophole in the law which meant that by renaming the operator of some of their services to 'Moto M&S', they could advertise the new shop. Moto services which have an M&S and a Costa don't actually refer to Moto on their signs, instead they use the name 'Costa M&S'. Welcome Break have partnered up with Waitrose to rival the Moto-M&S connection, and more recently Roadchef have started to team up with Spar to conquer the same sector. In 2016, M&S introduced their "Food to Go" branding to replace smaller M&S Simply Food stores. These stores have a smaller variety of items than standard M&S Simply Food stores and are more tailored to the grab-and-go customer. 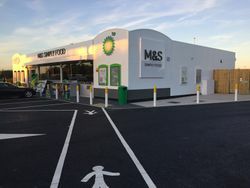 As part of this, in 2016, Moto introduced an M&S Coffee To Go machine at Cherwell Valley and in 2017, M&S Food to Go units were opened within the northbound BP store at Michaelwood. The link between Moto and M&S was made after Granada (who spent a lot of time developing shopping areas) noted that they needed something simple to cope with sudden rushes of customers. They said they wanted a retail outlet where you can walk in and see high-quality food and other products around you. Five services were earmarked to get the new brand but in practice it took them five years to roll it out. By now M&S Simply Food had set up railway station stores operated by SSP, who were Moto's sister company at the time, so the partnership was natural. Trusthouse Forte had a grocery shop called 'Piknics' in the late 1980s, but this mostly sold sandwiches.